Every family loves to go camping; it’s the best time to connect and create closer relationships between parents and children. Quality time shared with family members brings good vibes to last a lifetime, especially when you come to go camping in St George. Family camping immediately brings to mind a picture of the members singing around a campfire or reeling in a fish. But the picture is not always perfect as you have to contend with bugs or sudden downpours, plus the contest to use the iPhone. The good news is that successful tent camping is always possible through sound planning and valuable survival tips. Plan small – An ideal family camping trip is short and small. A weekend is enough time for bonding and should not be too far away as to waste time traveling. Involve the family in your plan – Every family member should add his/her feedback and suggestions for the trip. Make early plans – Make reservations ahead for the campsite, pay in advance and make allowances for family meals. Be organized and prepared to face eventualities that are less expected. Check amenities found in campsite – Look for a location that has lots of hiking trails and water holes to provide more activities. If a family member is sensitive to personal needs, find a campsite with toilets. Get the proper gear – Have decent equipment and learn how to use it. Purchase leak-proof tents from authentic outdoor stores and comfortable sleeping bags that insure the right amount of warmth. Pack enough clothing – Your kids will surely get wet and dirty in the camp. Pack adequately and the right type of clothing: enough for daytime wear, as well as swimsuits, pants, sweaters, rain jackets, hats and other clothing appropriate for the campsite. Have fun – Keep the fun going with activities to challenge the kids — arrange a contest of who can build and light a campfire the quickest or reel in the biggest fish. Make chores an enjoyable activity by giving a prize to whoever gathers the most amount of rubbish at the end of the trip. The winner is gets to choose the soundtrack on the ride home. Avoid boredom – Kids are likely to complain that they get bored, so prepare entertaining activities like popping popcorn or heating marshmallows over the fire. Any type of ball or wilderness bingo is a good pastime. Kids enjoy puzzles and books. The environment can be the best venue for the alphabet game. Don’t forget nutrition – For your first camp meals, just heat meatballs and sauce you prepared at home with some pasta. For campfire treats, you can have the spiced nuts. Bedtime snacks for the kids will be some hot chocolate. This is a good time to introduce veggie meals. You can cook burgers and sausages over the campfire with relish and chutneys you brought. Sweet treats to boost your kid’s energy are ginger cake, lemon squares and brownies. Family camping is the best option to spend the hot months of summer. It is the time to unwind, share the joy of relaxed living with family and appreciate the gift of nature. 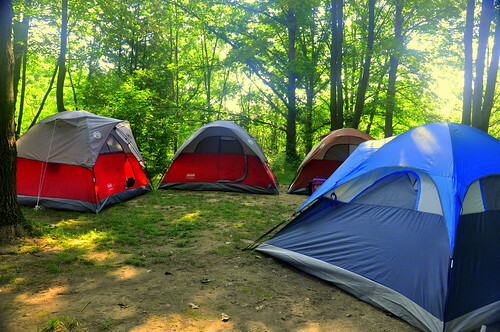 Obviously, it can be one of the most intimidating experiences, but observing these tips will go a long way in surviving a family camping trip. There are a lot of places to camp near St George, so just take a look at our camping page to learn more.